Our episode begins when a man named Ramon is abducted after a car window-washing gone wrong. 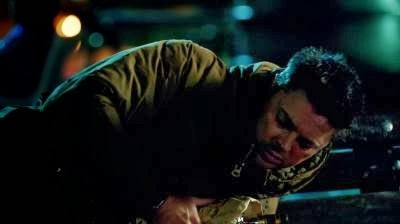 We quickly learn that Ramon is at the expense of a former Police bombsquad member, no longer fit for duty, named Simon. Simon places an advanced neck bomb around Ramon's neck and puts tons of small sized cameras in Ramon's car where his adult game of 'Simon Says' is live streaming on the internet, where online enthusiasts gather in chat room to root Simon's victim's forced exploits and ultimately his demise. 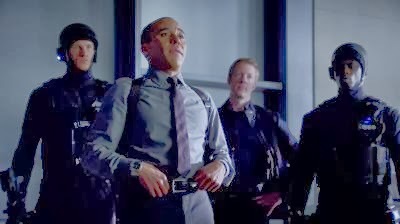 After holding a hostage at the bank, the Police find themselves on the hunt for Ramon, but by the time John and DRN catch up to him it's too late to disarm the bomb and we witness a shield placed over Ramon, and John apologizes and promises that he will find the man responsible for doing this to him. The bomb explodes inside the shield and Ramon is dead. The man hunt continues when the next victim Jeanie Hartman, the daughter and employee of Joe Heartman, an advanced coloring-flower- florist, is lured into Simon's hands and she with a neck bomb also begins to broadcast live. This time despite all of DRN's most comical malfunctions and over emotional outbursts, including when in front of Captain Maldonado, DRN is able to get by and do his job, as he continues to loose more and more power! Luckily this time they are able to catch up to Jeanie and remove the bomb, but the now known former bomb squad member Simon is one step of the police and is able to blend into the disarming the bomb scene and take Kennex for his next victim! John awakes on a park bench in front of a huge clock tower at what seems to be a town square. DRN and the police arrive on the scene to save John, but unfortunately he now has a remote detonator and can see the police officers in his view. DRN quickly realizes that there must be a vantage point and is able to calculate that Simon resides on top of of the clock tower. He tells the team that he thinks he can sneak in unseen and can stop Simon by giving him and the detonator an electric charge. Simon tries to explain his jealously and social injustice that has been put upon him after falling a psyche evaluation, pointing out that John is back on the force, despite also not have a good psyche evaluation either. He goes onto to say how he had been marked and unable to even get a loan from the bank, but John points out that terrorism is no injustice corrected. Meanwhile John tries to reach for a token that he thinks can help stop the bomb from going off, but DRN on the verge of completely loosing power, is able to save the day and electric charge Simon, but not without toppling over him! Our episode ends with John coming through for DRN by allowing him to live with the also lonely Rudy Lom who can't wait for nights out on the town and bringing back girls--whether they be his or DRN's! Again we have a not so serialized episode, although I think this one you can tell should have come before "The Bends", which as mentioned in The Bad Robot Factor below, actually indirectly ties back with that episode a great deal. That's not to say I didn't enjoy the episode. It was made exceptionally fun due to seeing yet again a different side to DRN and it's becoming clearer that a few of these episode are trying to build toward the DRN identity aspect in the series.Michael Ealy had done a fantastic job in showing us these different aspects whether it be a physiological/mechanical issue, seeing another DRN and his reaction to that, and by building an on going relationship with John Kennex. Ultimately he is what is making the series charming and delightful. However, Michael Irby's Richard Paul was more hilarious in this episode. It allowed me to warm up to him a bit, despite that he could still easily be a villain and/or antagonist. It was also nice to see an interaction between Captain Maldonado and DRN, and I was glad at the end of the episode she granted DRN permission to live with Rudy and not continue to be with the MX's. Another thing I liked about the episode is how it was laced with so many references. It made it feel like that this things do in fact go together and that there is still a story in here somewhere and I hope starting next week we can start to get on with it before it's too late! 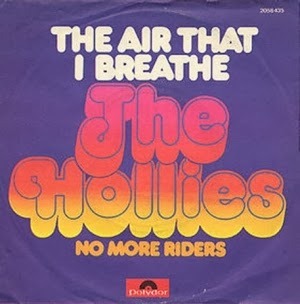 Note: The Hollies "The Air That I Breathe" song reference. Each week after my review I will bring this section relating to many things Bad Robot in relationship to the episode, as I feel certain Bad Robot often makes a point to reference themselves with similar characters, subject matter, riffs, easter eggs, aesthetics, contrasting situations, & occasionally shared pop cultural references. So this section is to explore the possibility of those things, which may provide some and insight speculation and at the very least food for thought and/or trivia. I also think it's just fun to be able to reminisce! Our episode title this week seems to be a double reference. In the Fringe episode, "Inner Child", Olivia Dunham's niece, Ella, plays Simon Says at the end of the episode. The name Simon itself also seems to be thematic to Fringe, as with Simon Philips, Simon Foster, and Simone the Oracle. Additionally the this scenario is reminiscent of the third in the Die Hard franchise: Die Hard With A Vengeance in which the villainess Simon Peter Grubber (Jeremy Irons) summons John McClane (Bruce Willis) and partner Zeus Carver (Samual L. Jackson) to almost impossible tasks as he places bombs all around New York City. Die Hard was also referenced in the Almost Human episode, "Are You Receiving?" Note: Writer and Consultant Producer J.R. Orci (The Brother of Roberto Orci) worked with J.J. Abrams on Alias & Fringe and producer/writer John Eisendrath worked with J.J. Abrams on Felicity & Alias are both currently producing/writing for The Blacklist. 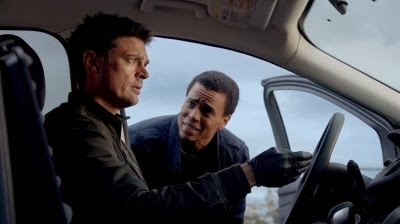 The Blacklist also alluded to Die Hard this season ("Anslo Garrett") and this episode of Almost Human mentioned being black-marked, which is another way to say "black listed". Alias also often had techno music featured during it's action sequences. Note: Emma and Ella are similar and recurring Bad Robot (and Friends) names. Wallace is also a recurring surname: Lost: 108 on Jacob's Lighthouse, Super 8: Jackson Lamb's stolen military uniform name/alias, Star Trek Into Darkness: Carol Marcus alias 'Science Officer Wallace' (mother's maiden name). Note: Green is also the color of energy in the second season of Revolution, as this is the color the nanites sometimes appear as. 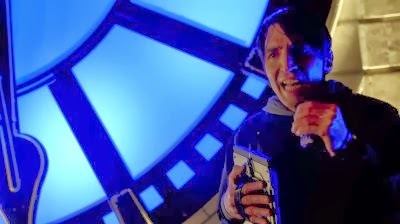 "Simon Says" also seemed reference and parallel things from other Almost Human episodes. There's a few references to "The Bends". First we have a parallel between Ramon talking on the phone to his wife before he gets himself into a horrible situation similar to the cop Trevor Cooper. 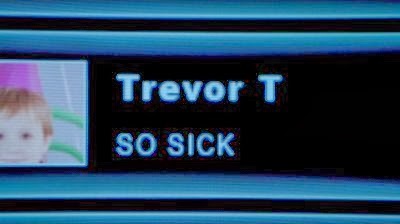 Trevor also happens to be a name of one the people discussing the victims on camera in chat the room! Both episodes feature rogue cops and reflect certain aspects of John Kennex (Simon - bad psych valuation, Trevor - lost his partner). 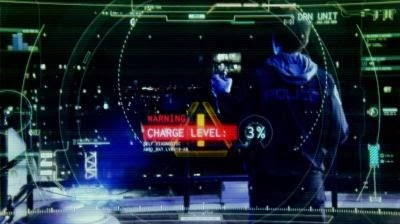 The color "green" is again highlighted as this is the color that marks androids being fully charged. -And Rudy mentions he's excited to go out on the town, when in "The Bends" he actually does go out on the town! And perhaps again in "Are You Receiving? with the mention of online romantic profiles. 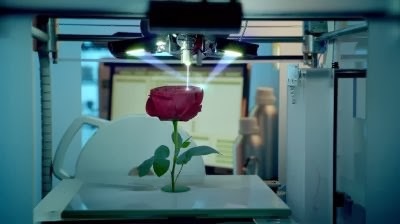 There were flowers all over the episode, which surely isn't exclusive to Fringe or Bad Robot, but because of the twisted story with Simon, I was reminded of the season 4 episode "Wallflower" and/or "A Short Story About Love". I thought about dandelions, white tulips, and digital roses. Flowers tend to remind us of important events in our lives and/or commemoration and may become an important theme. Actress Leanne Lapp who played Vilma (the lady at the bank) also played a small role as "passenger" in the Fringe episode, "And Those We Left Behind". Actor Michael Sangha ("uniformed police officer") has just recently appeared in Adam Horowitz and Eddy Kitsis' Once Upon A Time in Wonderland as adult Miza ("Bad Blood"), but also he appears in Battlestar Galactica [re-imaged] prequel Caprica, which also actor a Alessandro Juliani (Ramon) was a main Battlestar Galactica cast member, which in addition Fringe occasionally referenced Battlestar Galactica and Caprica ("Subject 13", "Stowaway"). 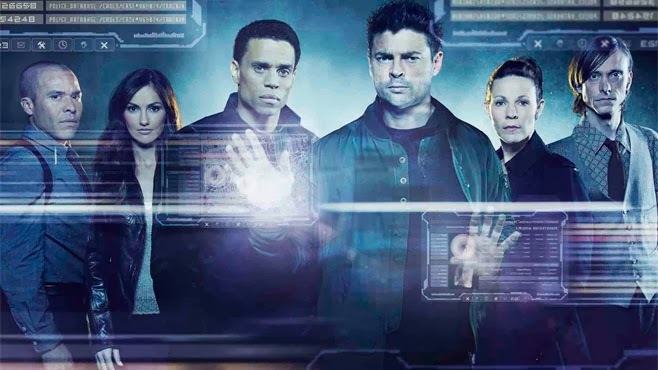 Considering Almost Human has an advanced robotic humans and terrorism themes and/or subject matter, might BSG and Caprica also be referenced here. 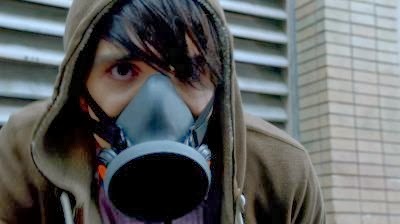 Simon's gas mask is very reminiscent to Fringe's final season and promotional art. 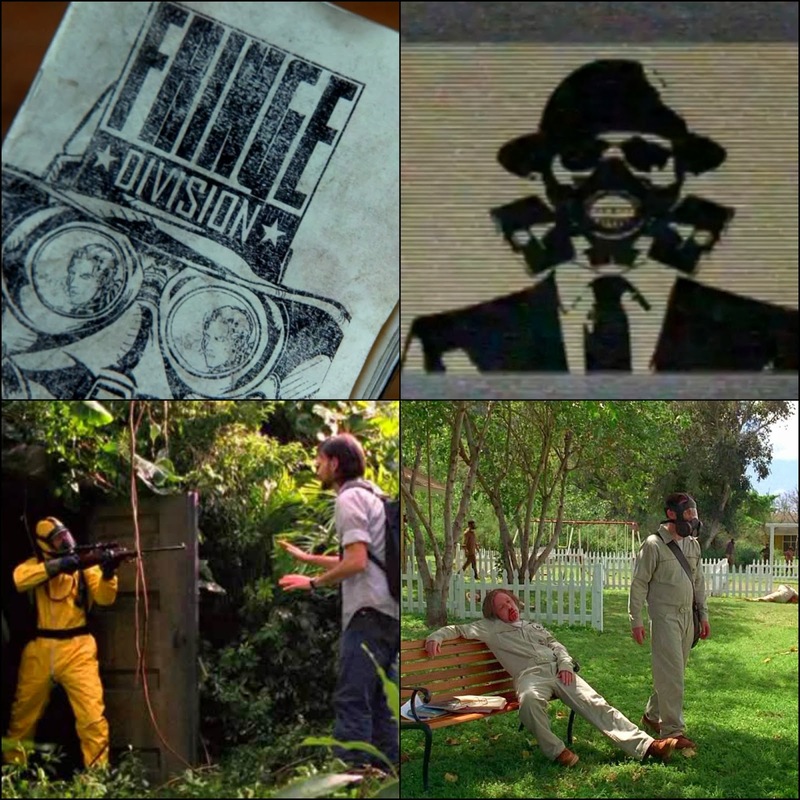 Additionally gas masks and hazmat suit are also iconic to LOST most notably with Desmond David Hume and things relating to the Dharma Initiative and the Others. (Both shows have a kind of "purge"). Laura Becker (Darthlocke 4) is a long time commentator, TV addict, and aspiring writer participating with other fans on SpoilerTV. She writes reviews and analytic type articles. Some of her other interests include philosophy, cultural anthropology, reading, drawing, and working with animals, as she grew up and continues to work on her family's horse farm.